Cheeky Poke: no longer just a way to flirt with your crush on Facebook, and now Newstead’s newest nori neighbour. 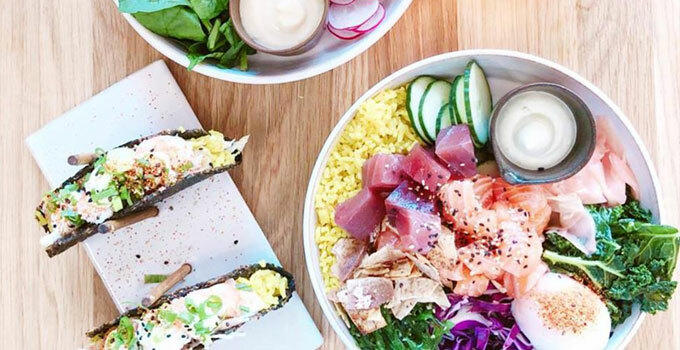 Brisbane has definitely embraced the poke trend over the past year, and Cheeky Poke offers bountiful bowls of sashimi salad, miso broths and colourful tacos, proving that eating healthy doesn’t have to be boring! These vibrant crunchy salads can be custom made – or you can choose one of their cheeky signature suggestions. Poke bowls start with a base of black, brown or turmeric coconut rice, before being piled high with salad (think spinach, daikon, cucumber, kimchi, wakame and edamame beans to name a few!). Next comes an abundance of protein – and if kingfish, salmon, scallops or prawns are not your favourites, then the chicken or tofu are equally worthy contenders. For seasoned poke bowl participants, you may want to try their cheeky alternative – the sushi taco! Yup, sushi and taco had a cheeky poke of their own and created an epic love child! A crunchy nori or wonton shell with a layer of coconut turmeric rice, topped with cabbage, avocado, pickled ginger, togarashi, and your choice of protein with sauce. Try the salmon with wasabi mayo, tofu with house sesame and soy or chicken with creamy Asian sauce and be prepared for the taste buds to tingle! Grab a cheeky handful – of sensational salads and tacos to talk about, and have a tipple or two of the creative cocktails on offer (our pick: Miso Sleepy feat. Spiced rum, miso caramel and filtered coffee). Cheeky Poke Bar is located at 63 Skyring Tce Newstead, and is also available on UberEats and via their own takeaway app (search for Cheeky Poke Bar in the App Store!). - the gourmand who's bowled over by poke. It’s not poke it’s poh-keh (thank you Hermione Granger).